Chronic limb ischaemia is peripheral arterial disease that results in a symptomatic reduced blood supply to the limbs. It is typically caused by atherosclerosis (rarely vasculitis) and will commonly affect the lower limbs (however the upper limbs and gluteals can also be affected). Around 15-20% individuals over 70yrs have peripheral arterial disease. The Framingham study demonstrated an increase in the prevalence of the disease from 0.4 per 1000 males aged 35-45yrs to 6 per 1000 males aged >65yrs. In this article, we shall look at the clinical features, investigations and management of chronic limb ischaemia. The clinical features of chronic limb ischaemia depend on its severity, as shown in Table 1. One of the earlier symptoms is intermittent claudication, a cramping-type pain in the calf, thigh, or buttock after walking a fixed distance (the ‘claudication distance’), relieved by rest within minutes. Buerger’s test involves lying the patient supine and raising their legs until they go pale and then lowering them until the colour returns (or even becoming hyperaemic). The angle at which limb goes pale is termed Buerger’s angle; an angle of less than 20 degrees indicates severe ischaemia. Leriche syndrome is a form of peripheral arterial disease affecting the aortic bifurcation. It specifically presents with buttock or thigh pain and associated erectile dysfunction. Critical limb ischaemia is the advanced form of chronic limb ischaemia. On examination, the limbs may be pale and cold, with weak or absent pulses. Other signs include limb hair loss, skin changes (atrophic skin, ulceration, or gangrene), and thickened nails. Clinical features that are less than 14 days duration, often presenting within hours. *Acute-on-chronic ischaemia is a more complex condition whereby there is an acute often embolic event in a patient with previous peripheral arterial disease. These patients are sub-classified as they typically have a longer duration in which the limb is salvageable. Any ABPI value >1.2 should be interpreted with caution, as calcification and hardening of the arteries may cause a falsely high ABPI. 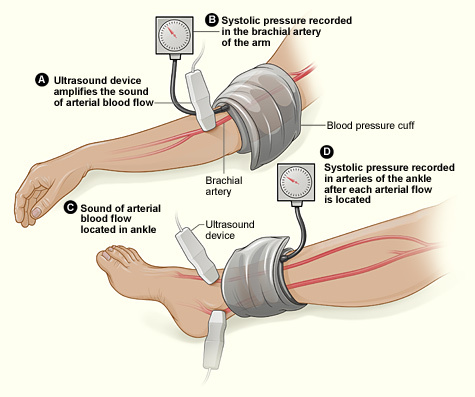 Any critical limb ischaemia should be investigated initially with a Doppler ultrasound, used to assess the severity and anatomical location of any occlusion. Further imaging can be achieved via CT angiography or MR angiography (MRA). Due to concurrent cardiovascular risk factors seen in patients with chronic limb ischaemia, patients should also have a cardiovascular risk assessment. This includes blood pressure, blood glucose, lipid profile and ECG. In addition, any patient presenting with chronic limb ischaemia <50yrs without significant risk factors should also have a thrombophilia screen and homocysteine levels* checked. The course of chronic limb ischaemia is variable and many patients’ symptoms do improve on lifestyle changes and medical management alone. NICE guidance states that surgical intervention can be offered in suitable patients if (i) risk factor modification has been discussed; and (ii) supervised exercise has failed to improve symptoms. Any patients with critical limb ischaemia should be urgently referred for surgical intervention. 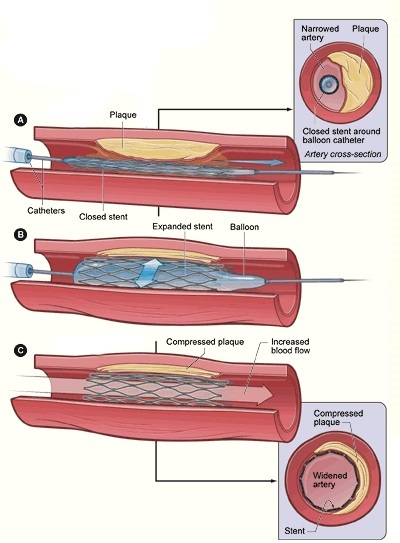 Amputations are considered for any patients who are unsuitable for revascularisation with ischaemia causing incurable symptoms or gangrene leading to sepsis. Chronic limb ischaemia can result in sepsis (secondary to infected gangrene), acute-on-chronic ischaemia, amputation*, and reduced mobility and quality of life. Two years following a below-knee amputation for chronic limb ischaemia, 15% require a further above knee amputation, 30% have died, and only 40% have full mobility. The 5 year mortality rate in those diagnosed with chronic limb ischaemia is around 50%. Which of the given tests is a gold standard for diagnosis of peripheral vascular disease? According to Poiseuille law, the pressure drop in the stenotic region of the blood vessel can be described as which of the given options? Which of the given options is not an indication for surgery in the case of peripheral arterial occlusive disease? Which of the given treatment options is an initial first line treatment for claudication?